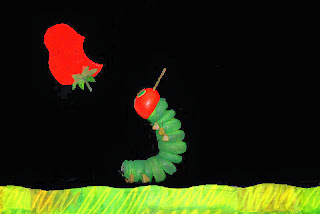 Brooklyn Center for the Performing Arts at Brooklyn College continues its 2013-14 Target Storybook Series with Mermaid Theatre of Nova Scotia's The Very Hungry Caterpillar & Other Eric Carle Favourites on Sunday, March 16 at 2 p.m.
All tickets are $7 and can be purchased by phone at 718-951-4500 or online at BrooklynCenterOnline.org. Recommended for ages 4 and up, this production replaces the previously announced A Brown Bear, a Moon, and a Caterpillar: Treasured Stories by Eric Carle in Brooklyn Center's schedule. The Very Hungry Caterpillar and Other Eric Carle Favourites includes the story of The Very Hungry Caterpillar's quest for food and his eventual metamorphosis into a beautiful butterfly, Little Cloud's adventures high up in the sky as it transforms itself into various shapes of things it sees, and The Mixed-Up Chameleon's discovery of his own unique nature as he explores his ability to change color. Audiences familiar with Mermaid's other adaptations of Eric Carle's books can expect the same attention to detail that has won international acclaim for the company. Mermaid's accomplished creative team is widely respected for unique and well-travelled collaborations. Adapted, directed, and designed by one of Canada's most esteemed puppetry creators, Jim Morrow, the triple-bill production incorporates narration by storyteller Gordon Pinsent, original music by composer Steven Naylor, and the magic of black light to bring these three beloved stories to life. Company members include performers Kat McCormack and Simon Rainville, and stage manager Shawn Sorensen. Award-winning children's book author and illustrator Eric Carle has written and illustrated more than 70 children's books. Born in Syracuse, New York, he spent his youth in Germany where he studied fine art. He later returned to the United States to work as a graphic designer for The New York Times and later as art director of an international advertising agency. His delightful books combine stunning collage artwork with an imaginative approach to learning and have sold 25 million copies worldwide. Perhaps his most famous story, The Very Hungry Caterpillar has been translated into over 47 languages, and it remains an all-time favorite among children. Mermaid's accomplished creative team is widely respected for unique and well-travelled collaborations. Jim Morrow has ingeniously adapted the Carle stories from page to stage, as well as serving as Director and Production Designer. Steven Naylor created the musical score and oversaw the recording of the narration. Daun Windover and Bob Williams contributed to videography and animation elements, while Struan Robertson and Deborah MacLean lent their production and design skills. Company members include performers Kat McCormack and Simon Rainville, and stage manager Shawn Sorensen. The centerpiece of Brooklyn Center's 2013-14 family programming, the Target Storybook Series features performances based on classic and contemporary children's literature and aims to encourage the development of strong reading skills at home in children ages four to eight. Each performance is accompanied by a Parents' Guide, with literacy-based activity sheets, reading tips, and discussion topics, giving parents the opportunity to engage their children both pre- and post-performance. Other titles in the 2013-14 Target Storybook Series include Sid the Science Kid - Live! ; and American Family Theater's The Wizard of Oz. All seats for Brooklyn Center's 2013-14 Target Storybook Series are $7-$10. Parents' Guides can be downloaded at BrooklynCenterOnline.org/Target_Storybook.asp. Brooklyn Center for the Performing Arts' 2013-14 Target Storybook Series is sponsored by Target. Bannerizer makes it easy for you to promote ClickBank products by banners, simply visit Bannerizer, and get the banner codes for your picked ClickBank products or use the Universal ClickBank Banner Rotator Tool to promote all of the available ClickBank products.